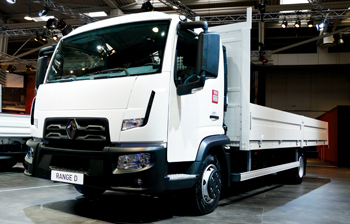 Renault Trucks is looking at a modest increase in sales with its new RT range launched last year. The new range across C, K and D had its Middle East launch in November 2014 in Doha, Qatar, for various applications. “We are expecting a 12 per cent growth in sales between 2014 and 2015 with the ‎new RT range,” said Marco Bonaveglio, marketing and communications director, Renault Middle East. Bonaveglio discussed how individual segments in the new range were faring since its launch. “The D and K ranges are a great success in Qatar ‎with mainly the municipality and construction applications. The K and C ranges are very ‎popular in Oman and Qatar for example. We have also seen a growth in other markets such as ‎Egypt and the UAE where the full range is becoming more and more popular depending on ‎the application,” he said. Bonaveglio attributed the RT range’s good performance to “new standards in terms of robustness and productivity and the capacity to accept a variety ‎of body type.”. Qatar and Oman were listed as the top two markets for Renault Trucks’ new range in 2015, with the UAE next. However, in 2016, the company sees high potential for the range in Saudi Arabia and Iraq. “Renault Trucks will expect a surge in sales in 2015 and this will be mainly due to heavy government investments in the construction industry to support big projects across the region such as those in Egypt to reorganise the country including the Suez canal project, the modernisation of the infrastructure in Iraq, Expo 2020 in Dubai, the World Cup in Qatar, and the massive construction projects in Saudi Arabia,” said Bonaveglio. The company expects its flexible financing programme will help push sales across the region. Bonaveglio says the programme will also bring “added value to customers.” Added value. Renault Trucks works with a large network of regional and ‎international banks which deals through a range of currencies including US Dollars, Euro and SEK, allowing regional business’ greater financing options. With financing typically up to five years, which can be tailored specifically to a business’ needs, the scheme provides a number of payment options designed to reduce payments or initial down payments, to build equity, and fixed rates for enhanced finance control. Sales of all kinds of Renault trucks grew 40 per cent between 2013 and 2014 in the Middle East. Renault Trucks in the Middle East has a strong dealer network in 13 countries with a number of expansion plans in the pipeline. In Iraq it has expanded by opening a CKD plant to manufacture their ranges with capacity to assemble 3,000 trucks per year. It will also open a CKD plant in King Abdullah Economical City in Saudi Arabia at the beginning of 2016 where 1,000 Renault Trucks can be assembled yearly. The plant is a joint venture between Renault Trucks and Zahid Tractor, the exclusive Renault Trucks distributor in the kingdom.